The following are excerpts from “On Michael Jackson” by Margo Jefferson. It’s edited by the blogger for continuity & relevance. Pictures are added by the blogger. Though he lived to the age of 77, he kept his black hair to the end—never a trace of gray. 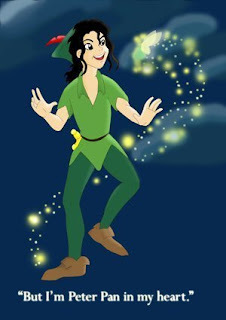 He is James Barrie who wrote Peter Pan. Peter Pan was a boy who wanted never to grow up. James Barrie was a grown-up who longed to be a child and spend his life with children—not other grown-ups. His childhood ended when he was 6 year old; his brother David died. He saw that his mother could not be consoled. She had lost the son she loved the most. His childhood never ended because he remained a 6 year old. He tried to revise his life by forever being the boy who was loved by other boys and loved by their mothers. Barrie's mother dominated his childhood and retained that dominance after he grew up. She became the heroine of some of his writings. Barrie's relationship with his mother has been described in terms of a relationship based on fantasy, as well as in terms of mother-worship. Neverland is a happy island but grief and lost are at its root. Peter Pan ran away from home when he was 7 days old. He escaped by the window and settled in Kensington Gardens. The birds taught him how to fly and he settled in with the fairies. Sometime, he would visit his house and watch his mother weep. The window was always open. He liked that she missed him. But one night when he arrived, the window was locked. When he looked in, she was asleep with her arm around another child. 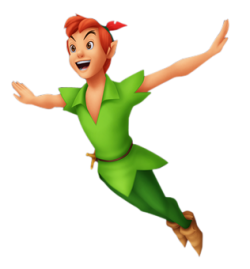 Devastated, he turned his back on her, flew to Neverland and turned himself the island’s boy-king. From that day on, he helped other children flee their parents to a life of pleasure and adventure. A Family can be like organized religion; just about any crime can be committed and hidden in its name and the Jacksons have plenty to answer for. Joseph Jackson works in a steel mill. When times are hard, he digs potatoes. But somehow he always finds time for sexual dalliances. Katherine turned her back to Baptist and Lutheran churches when she found out that their ministers were having extramarital affairs. Now her husband was doing the same. Under those circumstances, you'd better find a way to turn what you must bear into what you can bear. Katherine would turn her pain into a promise of salvation. Her new faith was a balm. Little Michael becomes a diligent Witness. He writes “despite all the time we spent rehearsing and travelling, Mother would find time to the Kingdom Hall.” Those words “Mother would find time” bother me. Katherine wasn’t the one constantly rehearsing and travelling. Michael was. She wasn’t “finding time” to take her spiritually needy son to the Kingdom Hall; she was making sure that he went there with her, stayed by her side and became one of the faithful. Faithful to the church and faithful to Mother. Religious sects proselytize. So do Mothers when they are in bad marriages. It’s their only sure weapon. They try to convert their children to their emotional cause—to win their abject love and loyalty. Every bit of pain becomes proof of Katherine’s goodness. in the foreground, trying to placate—afterward to attend to the beaten child’s hurt. Latoya was the first Jackson child to expose Joe’s physical abuse but Michael is a master at passive aggressive paternal payback. He has his own way of dealing blows that leave no obvious marks. In one of those deft underhanded jibes Michael regularly directs at Joseph, he gives Katherine the kind of praise one usually gives the father who provides for his family. “There isn’t one of us who’s ever forgotten what a hard worker and a great provider she was” he wrote, pointedly setting up an alternative to Joseph who turned the home into a 24/7 sweatshop. Joseph and Katherine Jackson pushed 5 sons to stardom and 1 to superstardom. They also created a group of emotionally dependent adults with damaged egos. Years of sibling rivalry had to be suppressed onstage and denied offstage. Jermaine: The brother thrice denied his chance—his right, as he sees it—to be a star: by his father, by his brother and by his boss, Berry Gordy. The only one Michael called “ a big brother to me.” It was Jermaine who walked him to the kindergarten, Jermaine whose hand-me-downs he wore. Jermaine was the brother Michael watched as a fledgling performer. From the first rehearsals in Gary, Jermaine had been at Michael’s left. When Jackson left Motown and Jermaine decided to stay, Michael was desolate. But as Michael carefully adds, on the night Jermaine announced his departure from the group, the remaining brothers went back onstage and got not one, not two but three standing ovations. Jermaine was to have neither a happy marriage nor a well-run solo career. He came to see Michael’s eventual triumph as a betrayal. And he learned to play Judas. 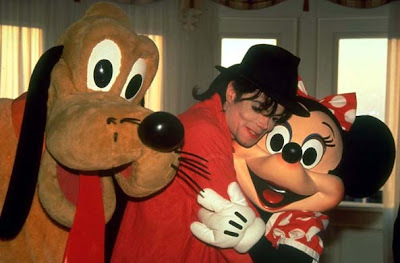 Michael: Without him, the others would hardly matter. A child prodigy makes life so hard for his siblings. He gets most of the attention without even trying. The others never stopped trying; they are always struggling to find an identity that matters to others and themselves. If they manage, they must accept the fact that their hard-won identity may yield a few rewards. Michael was gutsy. The only one who stood up to Joseph’s bullying. The older brothers took their punishment in silence then fussed when Joseph was safely gone. Talk about doing back-up when your little brother is singing the lead! Once Michael was no longer a child, he would construct his own various families according to particular and exacting specifications. First he brought together exotic animals, cartoon figures and mannequins. Then for parental and sibling figures to replace the tarnished ones he’d grown up with: Sammy Davis Jr., Fred Astaire, Jane Fonda, Liza Minnelli, Katharine Hepburn, Elizabeth Taylor—every one of them a lost boy or a girl, ripped untimely from a normal childhood by stardom or family tragedy. Then he went from kitsch and celebrity to children. The famous were first—Emmanuel Lewis and Macaulay Culkin. The unknown followed—the sick, the helpless, the needy coming to Neverland to frolic and be fed. He would be mother and father, a miracle worker. 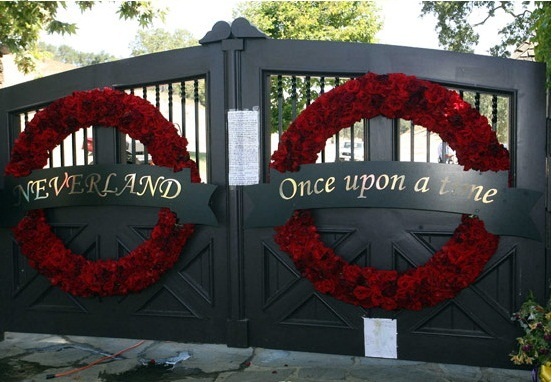 He would do at Neverland what ordinary parents should but would not or could not do for their children.